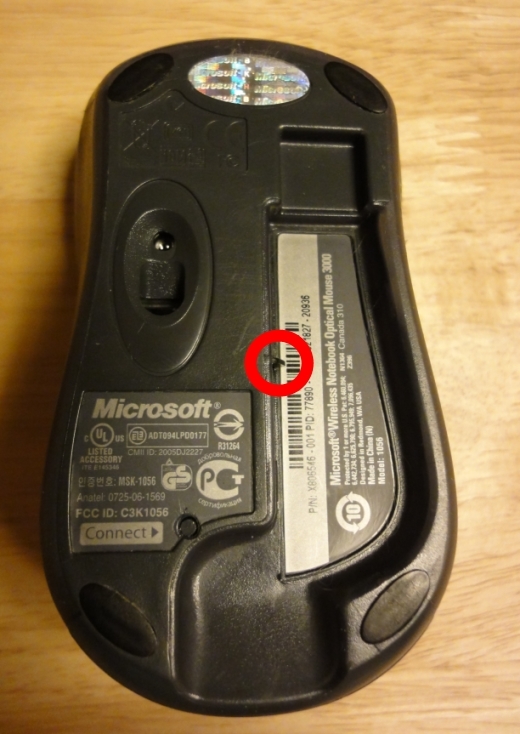 When my Wireless Notebook Optical Mouse 3000 stopped working, I initially thought the batteries were dead. After switching them out, and noticing that the problem persisted, I started searching for a solution. I tried a few-software level suggestions with no success, but then realized that even the red light under the mouse wasn’t working. Clicking on the “Connect” buttons on the receiver and the mouse didn’t help, either. I discovered that a small black springloaded piece comes out of the side of the area where the usb connector rests to turn it off. The small black piece is pushed back when the USB connector (notebook receiver) is pushed into the mouse. The small black piece was sticking and not coming all of the way out. I took a cotton swab and alcohol and cleaned around it and took a small screw driver and pushed it in and out until it freely moved all of the way out which turns the light on and eureka, it worked!!! !